Consider yourself a food artist? Witness this little masterpiece created with Grace Baking’s Organic Sprouted bread – a masterpiece in its own right if we do say so ourselves (15 trillion taste buds can’t be wrong). It’s a vegetarian’s delight and proof that done right a sandwich can convince anyone that you deserve your own cooking show. Some might say the secret ingredient is olive oil, others the black olives, or maybe the zesty Greek dressing. Nope. It’s the bread. And we’re not telling you how we make it. Ever. * For dressing: combine all ingredients in a small bowl and stir until combined. Set aside. Lightly brush all sides of bread with olive oil. In a medium pan over medium heat, toast all sides of bread until lightly golden roughly 2-3 minutes. 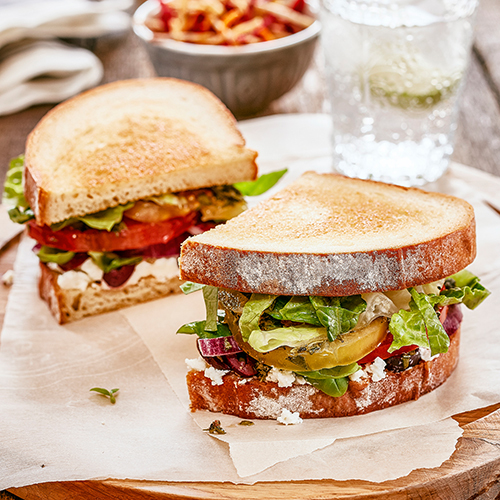 Spread goat cheese on one half of toasted bread followed by olives, basil leaves, onion and tomato. Spoon dressing over tomatoes and top with shredded lettuce. Top with remaining slice of bread. Cut sandwich in half and enjoy.